I laughed aloud very early on in this one, but it wasn’t at a joke. It was the announcer talking about the sponsor, Clairol: “The natural look, so appealing in a woman.” Different times. This special, unlike the first, is in color. The DVD we had gives it a slightly fuzzy quality, but it’s definitely in color. I’m not sure anyone told the set designer, though. Most of the special takes place in a featureless gray void which is rather depressing. There’s two credited co-stars for this special: Mary Martin and André Previn. Ms. Martin switches back and forth between charming and tedious, but Previn, a pianist and composer, is fairly amazing. Too bad he doesn’t get to do more here. We open with a long, illogical sequence full of dancers in decent costumes doing mediocre choreography in front of that ugly gray void. Bing has a number I can’t recall, and then Mary Martin sings for far too long about nothing. Really, her number is about the music in everyday life, which starts out fine, but then she has to go into a million and a half examples. There’s a dance number where a bunch of fit young dancers imitate Crosby’s slacker aesthetic, which also completely squanders the color format. And again, I guess it’s part of his thing to be half-hearted, but he just looks pathetic compared to actual dancers. Then a great jazz piece comes out of nowhere. Thanks, Previn! Martin and Crosby have a duet that’s meandering and far too long, and then Previn is back with an absolutely fabulous “God Rest Ye Merry Gentlemen”. Oh right, this is a Christmas show! Suitably reminded, Crosby sings “Little Drummer Boy” with a back-up choir who are reduced to dwarfs by a badly chosen camera angle, and then the finale. Oh, the finale! We’re doing Christmas “all over the world”, complete with the United Nations Children’s Choir, each delightful cherub in, shall we say, ‘ethnic dress’. It’s like It’s a Small World brought to life. Bing’s casual style completely undermines the potential sincerity of this tableau, so we can safely point out the silly things while the children gamely sing “Let There Be Peace On Earth”. The kids are distracted and poking at each other’s clothing. Israel is very young, and appears to be crying. Denmark (I think), lifts up her skirt in an attempt to remove her shoes during the final number. I love kids on stage. Of course, we close again with “White Christmas”. There are some good segments here, but overall this is just too long and tedious. 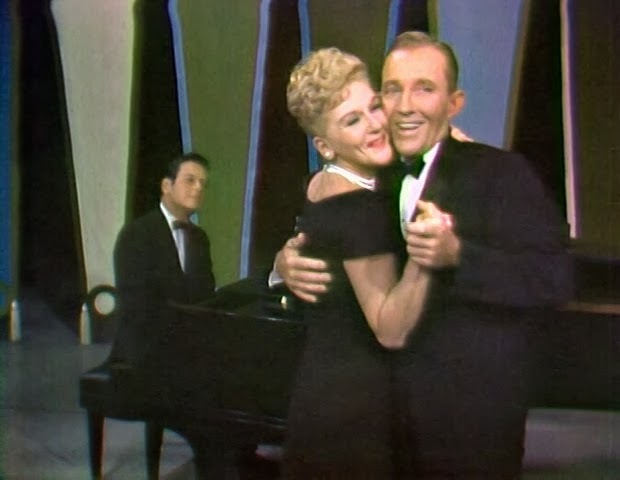 I felt bad for Mary Martin, who had to swan around in an assortment of unflattering dresses. Maybe it was the style of the time. Here’s a recording of Previn’s great arrangement of God Rest Ye Merry Gentlemen. Now you can skip the rest.